Lightly crush the nuts in a food processor. Tip into a bowl and mix with the sugar, orange-blossom water and rosewater. Preheat the oven to 180C. Brush a baking tray measuring 20 x 30 cm with melted ghee or butter. Add a layer of filo in the base of the tray and brush with more butter. Keep layering with buttered filo until you have used half the filo. Spread the nuts in an even layer on top. Continue layering with the remaining filo, brushing with butter as you go (you may not need all of the butter). Carefully cut the baklava into diamond shapes. Pour a little more of the melted butter over the top and bake for about 55 minutes, or until golden brown. Meanwhile, prepare the syrup. Combine the sugar, water and lemon in a saucepan over medium heat, stirring to dissolve the sugar. Bring to the boil, then simmer for 15 minutes, until slightly thickened. Remove from the heat and add the orange blossom water and rosewater. Pour the hot syrup over the hot pastry. The sound of the hot syrup as it’s poured onto the hot pastry is one of the best things, only surpassed by the sound of your first crunchy bite into this golden delicacy. Yum! 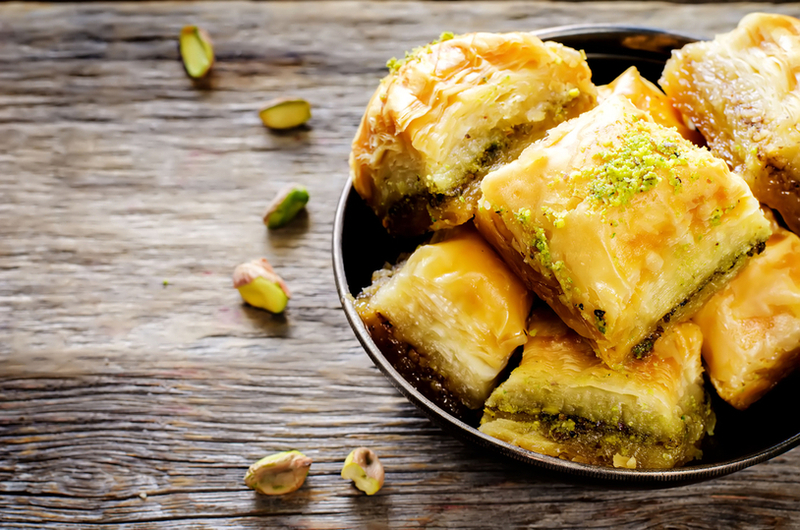 This is a fantastic recipe for baklava.